Miami-Dade Fire Rescue, family and friends saluted members of Graduating Class 125 in ceremonies on Friday at training headquarters in Doral. In photo at left, the MDFR training instructors and chiefs are seated on the front row, while the newest department members, 17 men and one woman stand. The recruits underwent an intense 10-week training at the academy. 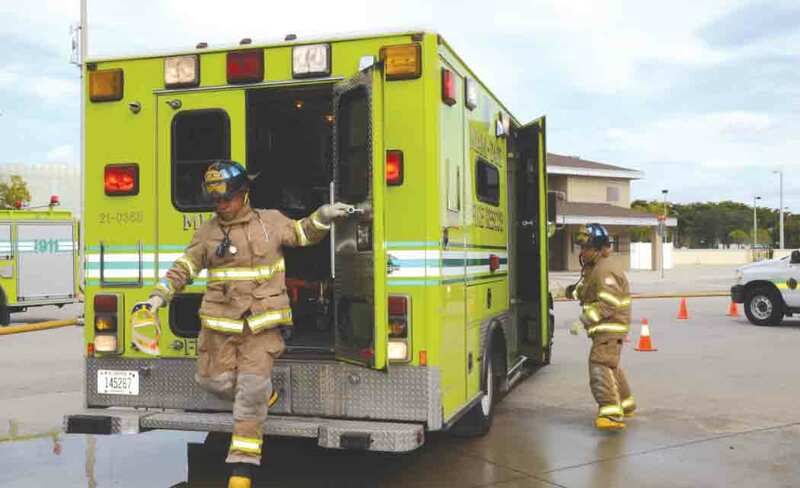 In the photo, right, a firefighter trainee arrives on scene of the trauma alert, and exits the rescue truck as quickly and safely as possible to give aid to the patient.